It is time for ODBD Stamping In Time Challenge(SNTODBD27)! The assignment is Our Daily Bread Design stamps. The challenge this rotation is "All about Love!" Love can be conveyed in many ways. You can use sentiments, stamps, or designer papers that use the word love or have a heart on them! You can use scriptures that actually use the word LOVE! Or, you can come up with your own idea about LOVE! Just let us know what you use to convey love! We look forward to seeing what you create using ODBD stamps! For my card I used Our Daily Bread designs Love One Another set. I colored it with Copics and cut the panel with Spellbinders Labels Ten . I matted that on Gina K Cranberry Tart cs cut with Spellbinders Labels Fourteen which I embossed with a Cuttlebug folder. I matted that with a white layer, embossed with a Cuttlebut Swiss Dot folder and cut with a Spellbinders Curved Rectangles die. I cut and embossed everything with my new Grand Calibur and I love how smoothly it works, yet makes an incredible impression when embossing! I used a Martha Stewart edge punch. This card was made to take to my church along with a lot of others to donate to a missions scholarship fundraiser. I bought a revolving card rack to have in the Church where people can take whatever cards they want... and hopefully will leave a donation in the attached box. My hope is that lots of cards will be taken for whatever donation people care to make, and that those donations will enable someone to go on mission who can't otherwise afford to do so. I'm resisting the temptation to see how much money has been raised so far, as it's only been in place a little over a week, but pray with me that God will use this in many ways.... it's always amazing to think what God can do with even a little thing! Just think... if someone goes on mission.... and someone else finds the Lord through that person... and then two more find the Lord through that person... well... the results could be far above what we can even imagine! Will you pray with me for God to use this little effort? Well... that's my take on the love challenge this week! Now let's see yours! 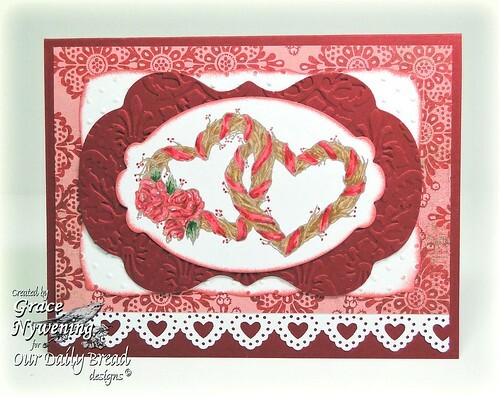 Simply link to the Stamping in Time Challenge on the ODBD Blog by Feb 9th! Can't wait to see what you come up with! Wow Grace! !I love the colors,paper,and your beautiful coloring of that ODBD image!! Wow Grace, this is lovely! Such a beautiful card! I love the layers! Thanks for sharing! :) Blessings! Love that labels die with the embossing Grace...gorgeous hearts, beautiful delicate coloring! What a lovely use of this stamp. It is precious. The trim adds to the country feel this gives. Your embossing is so clear and looks so clean! I love it! I am praying for your Mission's card ministry. I know just what you mean about one person sharing with 2 others, and how easily the Love of and For the Lord is spread all around this world! Wonderful idea! I'm sure your cards will go for a bundle! Gorgeous, Grace! The colors, patterns, and detailing are so beautiful! Lovely card! “Becca at AmazingPaperGrace.com is Sharing the Comment Wealth and I picked you” - I love this pretty valentine. Your colors are soft and you have a very calming style! It was fun to visit a new site! Oh this is so beautiful and adorable too. Grace, WOW I LOVE this layout and your colors are soooo beautiful!!! A perfect card for LOVE sweetie!! Have a great Friday! Thanks for sharing with us at Let's Ink It Up. I'm so glad I found your beautiful blog, even if I can't create wonders of art like some, I can at least enjoy the outstanding designs. What a stunning card Grace!! I just love the red, the embossing and your coloring!! Stunning Valentine card my friend!!! Very SWEET Grace! Thanks for joining us at The Sisterhood! Hope to see you again next challenge. Grace- this is soooo lovely! Beautiful twinkle on the flowers! Have a great weekend! This card is beautiful and it is easy to see where your love is and where it is going with the comment you stated about how this card will be used! I pray that God uses your wonderful talent to bless other people in ways far exceeding what you even expect. I thank God for people like you and you are a blessing to me when I read your blog. Thank you!! What a beautiful card Grace,I love the image and your papers. Beautiful card,the perfect image for our "Love" theme....thanks for joining us this week at Stampavie and More. Thanks for playing along with our Love challenge this time over at Craft Your Days Away! What a lovely card! Love your embossing. Thanks for sharing your talent at Southern Girls this week and good luck. Very cute project. Thanks so much for sharing and playing with us at Southern Girls. I hope we see you again.